NASA?spowerful Mars Reconnaissance Orbiter entered a protective slumber Wednesday -the fourth time this year - after inexplicably rebooting its main computer yetagain. 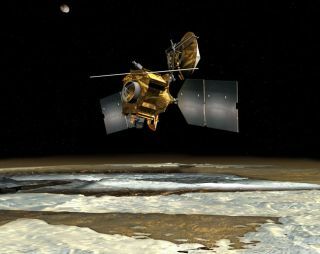 The anomalypopped up early Wednesday as the 4-year-oldorbiter circled Mars, marking the third spontaneous computerreboot for the spacecraft this year. In a fourth glitch, which occurred earlier this month, the orbiter switched to its backupcomputer unexpectedly. "Wehope to gain a better understanding of what is triggering these events and thenhave the spacecraft safely resume its studyof Mars by next week," said Jim Erickson, the spacecraft?s projectmanager at NASA's Jet Propulsion Laboratory, Pasadena, Calif., in a statement. Currently,the $720 million spacecraft is in a protective safe mode awaiting instructionsfrom Earth and is in communications with its mission control team, NASAofficials said. JPLengineers are working to diagnose the ailing orbiter?s problem before makingany attempt to resuscitate its six science instruments. The work is expected totake several days. ? The MarsReconnaissance Orbiter unexpectedly rebootedits main computer in February and June in glitches that engineers initiallybelieved were caused by hits from stray solar particles or cosmic rays. Earlierthis month, the spacecraft swapped to its Side B computer, a backup, also forreasons that remain unknown. In eachcase, engineers revived the spacecraft after a few days. NASAlaunched the MarsReconnaissance Orbiter toward the red planet in 2005. It is the most powerfulorbiter ever sent to Mars and has beamed home more data and images than allother missions to the red planet combined. The orbitercompleted its primary mission in late 2008 and is currently in the middle of anextended mission that runs through mid-2010.